In addition to the top to bottom & side to side customization of our Select & Deluxe models, the vZone features head to toe adjustable zoning to provide pressure point relief for hips and shoulders as well as additinoal lumbar support. 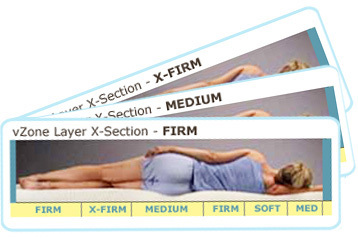 With the Posture vZone, your Talalay latex mattress is customized and adjustable in every direction! Pain Relief in Bed!